John Hanson aka Johnny Rooftop is a musician and writer based in Boston. John has been focusing on his writing, performing, recording and sound engineering. Follow John on Twitter @johnnyrooftop, or visit john-hanson.com to stay up to date on all his projects. Sixteen year-old New Zealand singer-songwriter has been making waves since the release of her first EP titled The Love Club. Her single “Royals” has been picked up by US independent and college radio stations and is gaining traction. Her voice sounds mature despite her young age and is cleverly recorded with complex, minimalist, yet forward-thinking beats. Lorde, born Ella Yelich-O’Connor, was actually signed to Universal at age 13 after an A&R scout saw video of her performing at a school talent show. Years later, she unveiled her talents to the world. Since blowing up the charts in New Zealand, Lorde released The Love Club EP in the US this June and saw it sell 85,000 copies in it’s first week. Her songs are poppy and vocally driven, with innovative beats to rival the best in hip-hop. “Bravado” opens the collection with a sort of personal admission that she knew she was destined to be here someday. Our heroine sings: “I was raised up to be admired, to be known.” Layered vocals preclude the entrance of a dynamic beat. Lorde, who writes her own songs, sounds confident in her delivery. The nuances in the production make for a well-rounded and exciting listen. “Royals” is far and away her strongest song on the EP. Witty lyrics describe an opposition to the materialistic boasting that is often found in pop-culture and popular music. She bounces through the pre-chorus, singing: “Everybody’s like: ‘Cristal, Maybach, diamonds on a time piece, jet planes, islands, tigers on a gold leash,’ we don’t care, we aren’t caught up in your love affair… we’ll never be royals….” This type of perspective is perfect for a generation more in tune to the issues of the world. The generation who is growing up with iphones giving them a world of information at their finger-tips… subsequently creating a generation too knowledgable to be caught up in meaningless materialism, especially in the midsts of today’s world economy. The layered chorus almost literally soars, bringing the listener to new heights of appreciation. “Royals” is infectious and content driven; it is no surprise this song is such a hit. More impressive production is displayed on “Million Dollar Bills” and “The Love Club” which feature beats created out of Lorde’s own vocal samples. This innovation gives Lorde a unique sound. “Million Dollar Bills” has the energy of a club song mixed with the lo-fi keys one might find in a Foster the People tune. These tow songs sound more typical for a high school artist: cheeky and energetic. The closing track, “Biting Down,” has more of an experimental, “out-there” vibe, with Lorde unexplainably repeating “it feels better biting down” over a pulsing beat. Lorde has released a few singles since the release of this EP, namely “Tennis Court” and “Swinging Party.” She has plans to release her first full length album in September 2013, which will be titled Pure Heroine. With The Love Club EP, Lorde has successfully provided a teaser to build hype for a huge response on her first full length album. Stay tuned. Brick + Mortar – This small town New Jersey band has a large, aggressive sound. Their newest release, which came out on July 30th, is titled Bangs and features hard hitting and very modern sounding rock songs, each with catchy and unique vocals to boot. The sound effects set them apart while strong songwriting throughout the album make them a band to watch out for. Choice tracks are “Bangs” and “Heatstroke.” The album is available on Spotify and for sale on Bandcamp. Lorde – Sixteen year old artist from New Zealand, Lorde, brings us a fresh alternative sound. She soars on her lead track “Royals,” which is complete with layered harmonies and lyrics about a counter culture to themes materialim in relevant pop music such as gold teeth, diamonds and Cristal champagne. The beats are minimalist in nature but with high quality production the end result sounds huge. Lorde, known to friends and family as Ella Yelich-O’Connor, is still finishing high school and reportedly works on her music during winter and summer breaks. Polymath – Instrumental art rock at its finest, the humble band from Brighton England is comprised of three talented musicians, led by Tim Walters, who are not afraid to push the envelope in order to create futuristic sounds, tempo changes and intricate musical pieces. Best place to check them out in on their soundcloud page where there are two teasers: Tetragon and Vertex. The band is hard at work, recording new material in the studio, and will be supporting Bosnian Rainbows on their UK leg of the tour. Thier new single Vertex is available for free download here. Bosnian Rainbows are the interesting new alternative rock project from Omar Rodríguez-López, founder of The Mars Volta. He had announced The Mars Volta would take a hiatus so that Omar can focus on this new project. He pulled his resources, bringing in Teri Gender Bender of Le Butcherettes on vocals, and keeping drummer Deantoni Parks who played with Omar in The Mars Volta and Nicci Kasper on keyboards, who has worked with Parks on various projects, Kudo and Dark Angels. The Mars Volta hiatus turned into an official break-up four months later, with singer Cedric Bixler-Zavala making a public statement about his departure: “I tried my hardest to keep it going, but Bosnian Rainbows was what we all got instead.” A rift in the large cult fan-base of The Mars Volta and mixed reviews from fans about the new direction Omar has taken with Bosnian Rainbows can be found all over the internet. Even as a distant outsider, it’s easy to tell there is more to this story. At face value, the Bosnian Rainbows’ sound is fresh and futuristic sounding. They are electronically focused, with Omar’s guitar pushed down in the mix, and the personality of Teri Gender Bender shining through, slightly resembling Geddy Lee of Rush. On the opening track ,“Eli,” an ominous bass line leads us through the spastic guitars as the song builds behind Teri wailing out “Why do you smile at me?” Off the bat, a truly strange quality is recognized. It takes a few listens to process, but there are slivers of genius present. “Worthless” makes use of glitch production, an effect largely present in the rap, techno and EDM movements but relatively unused in alternative rock music. Kudos. Up next, “Dig Right in Me” uses the same type of effect with Omar’s reverb-laden guitar riffs coming through strong enough to cut through the wall of noise created by Teri, Deantoni and Nicci. Strong songwriting reigns throughout the majority of tracks on the album. “The Eye Fell in Love” offers tight, melodic vocals broken by spooky sounding chord changes. The band plays with both minimalism and noise invasions throughout each tune. The album features a few surprising breakdowns, like the one on “The Eye..,” in which an unaccompanied, dissonant, note by note guitar riff keeps the song alive. Bosnian Rainbows are expanding the limits of the alternative rock genre in a real Omar Rodriguez-Lopez fashion, which of course is now expected of him. This time, Teri Gender Bender’s vocals encapsulate the listening experience, causing the music to drip with sexiness and angst. “Morning Sickness” comes across as one of the strongest songs on the album. Teri’s uncharacteristically light vocals are interrupted by a traveling riff and the introduction of a sudden mood change mid-way through. The first release by the band was “Torn Maps,” posted on the band’s SoundCloud page. Shimmering synthesizers are an odd feaure in the chorus. Teri sings “can we hold hands, I promise you they are clean;” a very modern line, indeed. “Turtle Neck” is also a very strong track, and one of the albums longest, and has an amazing shimmering delay effect on the vocal track towards the end. On “Always on the Run” we find Teri with the raw punk energy we would have expected from the front woman of Le Bucherettes. These eleven tracks from Bosnian Rainbows have enough depth to spearhead a career for the band. They have a very well-defined identity for a new group, which can be attributed to the fact that their musical bond precedes the conception of Bosnian Rainbows by a number of years. For example, Teri Gender Bender’s band’s (Le Bucherette’s) first album, Sin Sin Sin, was produced by Omar back in 2011. Omar is listed as a bassist in the band. Also, on The Mars Volta’s last tour, Le Bucherette’s opened for them. Another example is that Nicci Kasper and Deantoni Parks’ have had a standing partnership as a writing duo for years. The finished Bosnian Rainbows product is worthy of a second and third listen. It may take a few listens for the music to make any sense. Practice patience and reap the benefit. Say what you want about The Mar Volta break-up, but Omar Rodríguez-López has proven himself capable of expanding his horizons in a totally fresh and interesting way. This a creation deserves attention on a musical level and should be respected as an achievement. With KT Tunstall’s fifth studio album, Invisible Empire // Crescent Moon, the Scottish singer-songwriter presents us with her root-sy piece of soulful Americana and folk gold. Her 2005 break-out hit “Black Horse and a Cherry Tree” put KT on the map, though ever since she has been producing critically acclaimed records and building a large international fan base. The making of this new album, which was recorded in the desert scenery of Tuscan, Arizona, was divided into two sessions by major changes in KT’s personal life, including the sudden death of her father and the end of her marriage. This resulted in a release worthy of two titles. The folk elements shine throughout the entire album, while the later half comes off understandably more somber and reflective in mood. Even from the opening plucking of strings and deep chords on “Invisible Empire,” you can feel KT reaching the soul of your heart. She sounds like a woman in her prime, the music seems to flow with ease. She croons “I’m gonna burn this house, I know I wanna jump into the fire, I’m gonna tear them down, pinnacles of my invisible empire” like a queen in the middle of a dilemma looking down from her castle towers. “Made of Glass” continues the fragile theme with an entrancing chorus. Well chosen reverb creates the perfect space as KT explores Americana sounds to include whistling. Tunstall does not shy away from slow moving jams and provides the heart and soul to make each listen worthwhile. This slightly new style is curiously explored throughout the Invisible Empire // Crescent Moon saga. “Carried” sticks out with its up-tempo and individual sound, especially with the intro and re-occuring riff. She beautifully states: “we all need somebody to teach us how to be carried.” A truth so wise it can send a shiver down your spine. The folk sounds very pure on “Old Man Song,” a song which sounds like she dug it out of the sand in Arizona. The strings and piano on the “Yellow Flower” ballad act like a closer to the first half of the album. This is of course reminiscent of an old record, with two sides, which is evidentially an intentional effect. As “Crescent Moon” opens the next chapter is revealed. Instrumentally tied loosely to the end of “Yellow Flower,” though separated by ominous effects and a brooding electric guitar break. She sings “waxing and waning” like they are her moods: on the up-side of a difficult time and then regressing back down. “Waiting on the Heart” has a sweet country twang and shows a welcomed return to the stronger side of her soul. The album feels confidently personal, KT courageously singing and writing from her innermost blood cells of her heart. “Feel it All” displays a blues lead and a steady rock beat. Her last pre-chorus reads “cause our heart is on a wire, sitting pretty like a bird, But the hunter is hunting, And the eagle is us.” This beautiful imagery in the lyrics leads to a catchy, radio-friendly chorus. This song is a highlight and yet another example of KT’s open-hearted approach. “Chimes” could have been released in Venice, Italy and would probably still pass as authentic. Here KT Tunstall is obviously expanding the horizon of musical influences. “Honey Dew” follows a similar expansion, this time in the form of a ditty. The album closer “No Better Shoulder” is plays its role perfectly. The lyrics as well as her delivery are dripping with an enlightening, somber beauty. There is a patient build throughout the fist half of the tune, leading to some bold, spaced-out effects and an increasingly frequent snare snap. Expert production and professionally performed music with the bold display of KT Tunstall’s soul on every track are the consistent themes throughout the Invisible Empire // Crescent Moon album. KT proves way more than is necessary on this incredible release, seeming to pull it off without even breaking a sweat. This calm, moving album is sure to be a fan favorite and absolutely sounds strong enough to pull in an award or two this year. 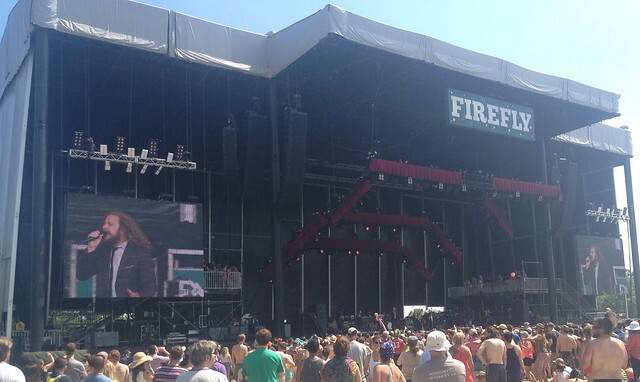 The second Firefly Music Festival in Dover, Delaware went off this year with great success. The headliners Red Hot Chili Pepers and Tom Petty and the Heartbreakers each put on incredible performances to audiences containing the majority of the 65,000 festival goers. The show took place at Delaware’s Dover Downs, an international speedway with over 100 acres of woodlands on the premises, which is where the entire festival took place. The campsites are set up about ten minutes away from the front gates on foot, for which the closed down a bridge road that goes over the highway and it is a decent trek. Once inside the two bigger stages are easily accessible and the two smaller stages are tucked away, about another ten minute walk. The festival grounds are littered with awesomeness, such as Heineken rave tents, the Dogfishhead brew house, an illuminated forest garden, a headphone dance party, hammock hangouts, and food stands. The first day was filled with anxious excitement. Wilde Belle led the buzzing audience into a groove with the swaying beautiful blonde front woman in shades Natalie Bergman and her brother Elliot. The band is super tight and set the mood right. Their songs “Backslider” and “Keep You” stuck out, even soared, surely gaining them new fans. Natalie’s infectious voice matched by the groups impenetrable grove with hard, nearly hip-hop-esque beats set the bar for three day to come. Public Enemy played on one of the back stages as the sun began to set on the first day. Chuck D was on point with his stage presence, bold and in charge. Foot soldiers stood guard of DJ Lord’s booth. Flavor Flav, depending on your stance of him, either made the show or ruined it, hyping the audience with his “Yeah Boy’s” and at one point taking a turn on the live drum kit. Public Enemy was a fun show and a taste of history for the mostly young crowd. The sounds and lights from Calvin Harris could be heard and seen from any distance. The pumping beat and light show took the audience by storm and people went wild. “Sweet Nothing” blasted throughout the grounds like the Festival’s soundtrack. Don’t let anyone say a techno show is not worth seeing, just tell them to check out Calvin Harris. Red Hot Chili Peppers took the main stage to headline first night of Firefly. The audience was literally packed like sardines, even from a great distance. With guitarist Josh Klinghoffer, the band still sounds classic as ever. They focused on big hits like “By the Way,” “Dani California,” “My Friends,” and “Under the Bridge.” After the slightly lacking solo on “Dani California” Anthony Kiedis advised Klinghoffer to “hate his guitar.” It was very interesting to hear him giving advice in front of nearly 60,000 people. The show was an absolute highlight of the entire festival, a very memorable experience. Alabama Shakes and their fearless leader Brittney Howard were a blast of old school southern style laid-back rock. Her voice on great performances of “Hold On” and “Hang Loose” shook the bolts every structure around. Edward Sharpe and the Magnetic Zero’s put on a early evening show, as the day started to cool down. “Home” was played with a large majority of the audience singing along. Leader Alex Ebert traveled out to the audience and asked individuals to tell us all a story, which slightly backfired due to most of people who he lent the microphone to being so excited that all they could do was compliment the song, except one guy who exclaimed that he proposed to his girlfriend the day before. Yeah Yeah Yeah’s played the mainstage as the day was turning to night. The trio rocked and sounded exceptional and very tight. Karen O’s personality on stage is attention grabbing, she even had some wardrobe changes. Guitarist Nick Zimmer showcased insane talent and Brain Chase was on point with his steady beat. The band was pretty obviously ecstatic to be playing to such a large audience, likely much larger than they are used to. Their show was an excellent surprise. MGMT were up next on the smaller main stage. The screens showed interesting psychedelic images, exploding with color. The band too was filmed in this way, so much so that you could not make out distinct feature of the musicians and they were reduced to silhouettes of moving colors. They jammed through “Weekend Warriors,” “Electric Feel,” “Time to Pretend” and “Kids” from their first album, focusing on fan favorties toward the end. Tom Petty and the Heartbreakers played on the mainstage to what seemed like literally everyone at the festival. While some of the group’s focus was on lesser known Wild Thornberry tracks and sleepers like “I Should Have Known It” off his newest album (2010’s Mojo), classics like “Free Falling,” “Won’t Back Down,” “Refugee,” and “Mary Jane’s Last Dance” were very much appreciated by the audience. Petty sounded as good as ever, the man seems to keep progressing despite his long track record. On the last day of shows, some downpours of rain cleaned up the audience. Dispatch played in the early evening. A crowd pleaser was a surprise feature of Brad Corrigan’s red-headed four year-old on a drum solo. The band was dynamic and each showcased their talents on a variety of instruments: bass, guitar, bongo’s and vocals were each played by almost every member throughout the show. “Alias” was a drum fest with all three members on a bongos. “The General,” “Two Coins,” “Flying Horses,” and “Here We Go” were played to an ecstatic, singing audience. Passion Pit’s front man Michael Angelkos proclaimed to the audience that he had terrible allergies, and after about 5 songs told us that he need our help because he completely blew out his voice. He mentioned that they had to cancel last year. Apparently he was being treated for his mental health issue, Bipolar Disorder. He said to the audience, “I didn’t know if I would ever be able to tour again.” The 90 minute set was reduced to 45 minutes, in which the last song had no vocals at all, with Anglekos going around to audience members to sing along, but unfortunately no one could really pull it off. 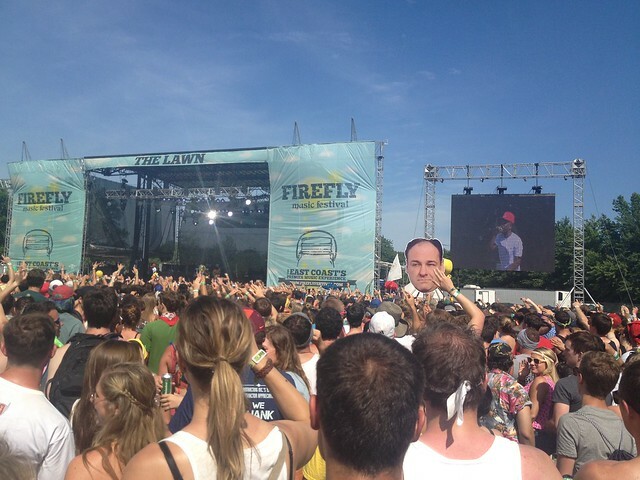 This year’s Firefly festival was very well organized and had an incredible line-up. The crowd ages ranged from 40-something rockers to yound children (with their parents) with a very large median age of late teens to mid-twenties. The people-watching was a blast, and the sense of community was apparent. The audiences in general were very responsive and the bands responded to this well, complementing our attentiveness and appreciation. Surely the number one complaint was the distance of the campsite to the festival grounds, next year Front Row Camping or Backwoods options are a must. The former mystery artist iamamiwhoami that is known for uploading ambiguous videos to youtube back in December 2009 with electronic, dance-pop music and trippy vocals turned out to be Jonna Lee, a Swedish solo artist who was vastly overlooked by the industry before this project. The music is expertly produced by her long-time collaborator Claes Bjorklund and contains a visual element that is equally important to the beginning of iamamiwhoami’s art. These videos, directed by Robin Kempe-Bergman, show Jonna with black make-up, contain themes of nature and birth, and have titles like this one: “13.1.14.4.18.1.7.15.18.1.1110.” All this built so much mystery around the project that at first there was speculation that the uploads were coming from Lady Gaga or Christina Aguilera. The question remained all the way up until August 2011 when Jonna Lee finally took credit for the material. Since her videos gained her popularity, iamamiwhoami has continued to release numerous music videos relentlessly, in fact this entire album was released in the form of music videos back in April 2010. The videos came out in order, titled “b,” “o,” “u-1,” “u-2,” “n,” “t,” “y,” “; john,” and “clump.” The visual element was professional and as intriguing as ever, with themes of nature and mystery, and Jonna in a limitless amount of strange costumes, depicted as an esoteric goddess woman with all black or other heavy make-up on her face. At first, her face is very rarely visable and when it does pop-up, we see a tall, light-skinned, blonde-haired Swede with electric blue eyes and interesting facial features. iamamiwhoami released her next set of videos shortly after the bounty uploads. She used the second set of uploads to release the album kin, under her own label, To Whom it May Concern. Removed from the visual element, Jonna’s project proves to remain truly enjoyable. bounty is technically her second release, though can be considered her first based on the order of the unveiling of the songs via video uploads. Now, with bounty officially released as an album, we again attempt iamamiwhoami apart from the strange visual amazingness. On “b,” Jonna begins our journey with spacey keys and a strange ominous, robotic effect on the vocals. Her airy choruses prove to be a theme throughout the quest. By the time the bass synthesizer kicks in, you are totally enthralled. “o” eases in, not finding its grove until the 90 second mark. Practicing patience is worthwhile for the infectious beat and a chorus that can stand up to any dance pop hit. There is a mind-bending pitch shift and phasing space elements that push the limits of the dance-pop and electronic genres, which are two types of music which rarely receive worthy praise for innovation anymore. 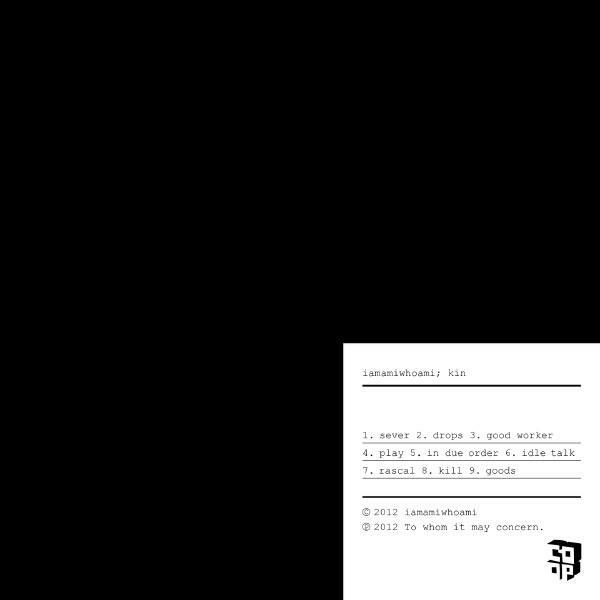 The lyrically unintelligible “u-1” is a sleeper but adds to iamamiwhoami’s pesona, something Jonna holds very tightly. Then “u-2” comes in like ride on the roof of a train during a fully charged acid trip. The electronic ballad pumps along at sub bumping levels, subject to both subtle and sudden changes. Producer Claes Bjorklund is in his element and sounds masterful. iamamiwhoami can be thought of as an entire strange universe orbiting around Jonna’s songwriting and Bjorklund’s expertly crafted soundscapes; the singer and the beat; a goddess in her odd world. With the rises and falls of “n,” it might prove to be the duo’s most collaborative effort on the album. Listening through each lettered song, it is curious whether the first seven songs on the album are to be considered one song. These songs are individual, but stylistically identical, which of course should be expected, seeing they are all by the same group. The take-away here should be that iamamiwhoami wants you to question their intent, they revel in the mystery that surrounds them. “; john” seems to confirm the theory that the first seven songs are one, offering a faster tempo-ed and fresh, poppy melody. The synthesizer rips heavily and the party is on. This song could be a hit but might end up be more popular in 2033. “clump” similarly rocks and shows us that even amongst all the mystery, the group also cares about dropping heavy beats for rocking out on the dance floor (picture a dark rave with neon lights and jet-black haired, half shaved-headed alternative trendsetters losing their minds due to the combination of drugs and bass vibrations traveling through their bodies). All in all, bounty is a futuristic, mystical and fantastic album. The iamamiwhoami project stands up very well as a purely musical experience. Because the videos were witnessed, the themes still dance in your head while listening, which was likely an intentional effect. Jonna and Claes are currently on tour sharing the live iamamiwhoami experience with their fans. Be on the lookout for future uploads or other mysterious surprises from the group, iamamiwhoami will always keep you guessing.